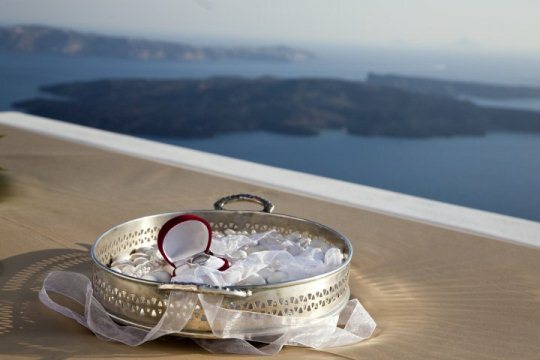 Santorini represents today, the preferred and most acclaimed wedding destination worldwide. With its world famous sunset, the Caldera awe-inspiring romance and the unique picturesque character of its villages, the Cycladic Island of Santorini welcomes each year the most sensational and memorable wedding ceremonies and celebrations. 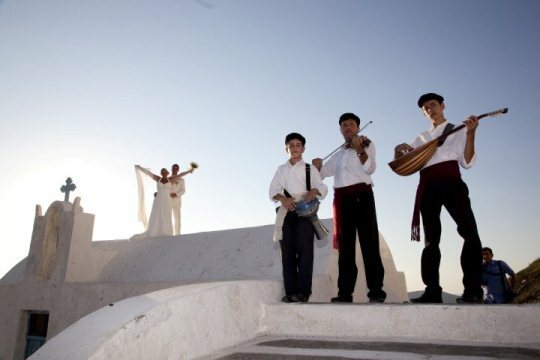 The events’ organization “Weddings in Santorini” has been planning the most successful weddings in Santorini for 3 generations and has rightfully deserved its great International reputation. What is your relationship with Santorini, how did you decide to organize weddings? I was born in Santorini Island and raised with its traditions, especially its wedding traditions which are not comparable to the weddings organized in the cities and mainland. Weddings in Santorini have been organizing weddings fro generations and its 30 years of experience combined to the Island’s history is transmitted from generation to generation with authenticity and love. That is what characterizes Weddings in Santorini’s people; experience and authenticity. Our team has a core of three persons; Evangelia who undertakes the wedding design concepts along with 3 other wedding designers according to each wedding concept & identity, Mosha who is in charge of the financial side of each wedding organization and Stella who is the on-site coordinator and takes care of all logistics. Our team is so complementary and welded that each wedding we organize is inevitably a successful event for the couple and their guests. How is celebrated a wedding according to the Santorinian traditions? Original Santorinian weddings are a truly unique experience. An authentic wedding in Santorini starts with a religious ceremony. The priest starts by cutting from the vineyards two male grapevines so that they fertilize to produce grapes. He then gives them to single girls who sing wedding songs in front of the bride, the bridesmaids and the family. Then they make garlands using the grapevines branches, gold floss and jasmine flowers from Santorini; at the same time, we prepare the traditional “koufeto” with boiled honey with grilled almonds which are offered them to everyone. The single girls are then called to make the wedding bed using custom-old majestic sheets and spread rice, flower petals and coins on the bed. When the bed is ready, a small boy lies on the bed. After the bed-making, the bride walks through the whole town of Santorini paved ad narrow streets accompanied by musicians playing violins and the single girls songs, enticing everyone they meet to come to the ceremony, where the groom is waiting for the bride. Following the wedding ceremony, the bride heads back to her room, where she finds “koufeto” at her door to offer it to her husband. According to tradition, the bride doesn’t let the husband eat the koufeto 2 times, and lets him eat it the third time. What was the most original wedding you have ever organized? We believe that all of our weddings were original since they all have a personalized approach according to each couple. For example we have organized a wedding ceremony on the Volcano; the couple arrived on a sailboat accompanied by beautifully emotional Greek music such as Hatzidakis and Theodorakis. The ceremony took place on the volcano where were settled barbeques with Greek Cuisine grill. On their way back from the Volcano, a dj was playing full power music on the sailboat, which completely overwhelmed the Aegean Sea! Another unforgettable wedding experience was a Hindu- Greek wedding we organized. On the first day, we had a wedding ceremony according to Hindu traditions and decorations. The day after, took place the traditional Greek wedding ceremony during sunset and on the third day, the couple and their guests went for a cruise on a sailboat from the morning and had dinner in a traditional fisher village. The beauty about this wedding was the fact that all people from different religions and origins gathered together on an Island to become one and to share unforgettable and beautifully authentic moments. Which are the new trends for weddings? The new generation weddings are all about styling. Each wedding’s styling is today very important since it is determined by the bride and the groom’s identity and personality, in order to celebrate the best day of a couple’s life in harmony with who they really are and what they like. Today’s weddings are back to the essential and very intense. The trend is to create the uncommon, the unique wedding, personalized according to each couple’s character. Young couples for instance, want to have fun with their friends and close family, with good vibes, good music they want to dance, eat drink and party! The conservative weddings days with the heavy decoration and obligations are gone. For example, in the location where the wedding takes place, all the space can be designed with a reggae concept and the tables dresses with Bob Marley vinyl discs. The difference in actual wedding trends is simple since the importance is given to the details. Details make the difference and that is the key to success for wedding planners since they are called to translate each couple’s character and identity into the wedding design and organization details. For example, Santorini is worldwide famous for its excellent wines; couples can therefore offer at their wedding reception a renown Santorinian wine branded with their names and wedding date. Another rising trend is the “do it yourself” wedding since couples tend to commit into their wedding organization and give an even more personal touch. The bride and the groom spend their personal time to create the favors, to chose wines from Santorini’s historical wineries and personalize each one of them by writing their names and wedding date calligraphically on the bottle or create original handmade goody bags for each guest. Outdoor wedding is definitely a new wedding trend worldwide and that is one of the reasons Santorini Island has become a wedding destination over the last years, since the couple and their guests have the chance to combine a great outdoor wedding celebration with their holidays. In Greece, “old-fashion” wedding cakes used to be the traditional layered cake made with fresh cream. In 2011, couples and their guests will have the chance to taste sweet flavors from the whole Greek territory, with a buffet including a delicious mix of traditional local sweets delicacies from Syros, from the Cyclades, from Thrace, etc. The new trend in wedding photography is to give a “vintage” color and theme in the setting and each photo’s movement. The photos’ setting shows a genuine Greek village background, with picturesque narrow paths, whitewashed Cycladic houses and Santorinian landscapes. 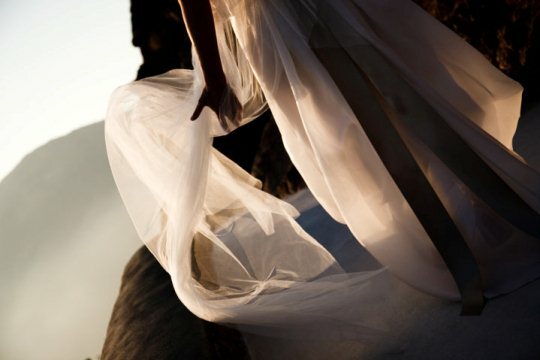 Can you share a wedding concept of Wedding in Santorini for 2011? One of our strong concepts for 2011 is the Aegean Blue Styling. We organized a great wedding which was filmed and will be shown on the US and UK Television Network at the beginning of New Year 2011. The space where the wedding takes place is dresses in the white and blue colors of the Aegean and the concept is to reproduce the drifting foaming sea inside the wedding space. During the ceremony, we installed an oblong table dressed with a blue plisse napkin representing the waves. On the table was set an outsized bouquet of immaculate white flowers. At the opposite side of the flowers, is placed an antique candlestick with 5 candles and a bouquet made with white paper boats. The isle is dressed with white antique wooden flower-pots stacked one next to another which are carrying white paper boats and wrapped with a white cloth. The whole wedding celebration space is designed with azur, white and blue marine colors, chairs are dressed with the same colors’ ribbons and white paper boats. There are even more details, but we won’t reveal anything else until the show is live on TV! This entry was posted in Destinations, Events, Tourism Insight. Bookmark the permalink.